What lies behind the story? Imagining the story of God's love? Telling the story of good news? Here are two ways I've done that in the past with some alternative, creative, storytelling communities in Adelaide – and now you can too! 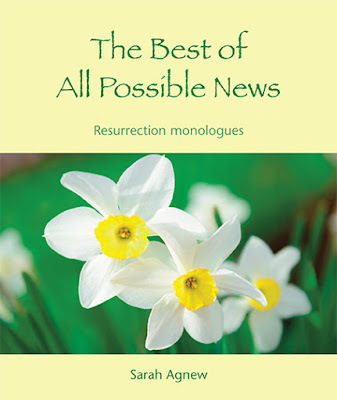 Click on the images or click here to go to Wild Goose Publications and download for use in your communities this Easter. This past Sunday, I was back presiding at gathered worship with my friends at Augustine United Church, Edinburgh. What a joy. I haven't been saying yes to many 'gigs' this year, as I concentrate on the thesis, but with the Lenten liturgy from Fiona, and the words I've already crafted for Pray the Story, the energy for preparation was well within manageable limits – and donning the alb and leading a community in worship is that delightful complex of energy-giving, and exhausting (in a good way). The reflection was shaped by the prayer-poem for the week, posted the previous Sunday on Pray the Story. That will be our midweek musing. Fiona has included a time for meditation: I spoke the prayer-poem for the epistle portion, which I wrote last year: Gift of Faith. And in our communion liturgy, we spoke the words of the Jesus Prayer (or Lord's Prayer) that I had crafted, also last year. This reflection on my recent experience of presenting my PhD work at the New College School of Divinity Biblical Studies Seminar first appeared in my monthly newsletter. Read more behind the scenes stories from the PhD experience, and from the further adventures of storytelling and poetry for free! Sign up over there on the right. 'Your translation of aspazomai was excellent.' So said Prof Tim Lim, and the expressions on the faces of friends and my supervisor indicated the value of that affirmation from a well respected scholar. It's one of the pieces of work I've done in the performance interpretation of Romans with which I, too, am most pleased. I was reading 1 Corinthians for a tutorial I was preparing to teach and unexpectedly found myself reflecting on a deepening of understanding of myself and my solitude. I haven't written about it for a while. I haven't really thought about it too much, either, recently. And that is what I noticed: I have at last settled into 'solitary' as my way of being. Paul spends a bit of time in this letter to the church in Corinth on sexual immorality. Chapters 5, 6 and 7 are mostly given over to the topic. Remembering that Paul wrote specific letters to specific communities with their particular challenges, questions, and concerns is helpful to counter any inclination to take his words as a rulebook for living for all people in all times and all places. Ghandi observed (and I paraphrase): there is one word in the English language worth saying more often - 'no'. One Sunday morning recently, these words were offered in the context of a reflection on Jesus' teaching to 'turn the other cheek', and the notion of creative response to violence and persecution. I was worshipping with my Edinburgh faith community, and our ecumenical partners, and the preacher was Rev Ali Newell, of the University Chaplaincy. Ali asked, does 'turn the other cheek' mean passive acceptance of violence? Is Jesus telling his followers to become door mats to those who would wield power over us? Or might he – here and in the breadth of his lived and spoken teaching – be saying something else?